Two secondary ion mass spectrometry laboratories in Arizona State University’s Bateman Physical Science Complex were recognized as hotbeds of scientific research, thanks to the expertise of researchers in ASU's School of Earth and Space Exploration and Department of Chemistry and Biochemistry. 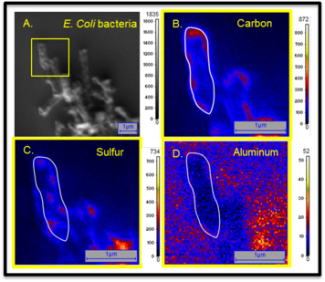 Images from NanoSIMS showing the location of elements in E. coli treated with natural antibacterial clay. The data confirm which elements are critical to the antibacterial process and shows the resolution of trace element mapping by SIMS. Credit: Images by Maitrayee Bose; research by Keith Morrison and Lynda Williams in the ASU SIMS Facility. Professors Richard Hervig, Lynda Williams and Christy Till of the School of Earth and Space Exploration, and professor Peter Williams and postdoctoral researcher Maitrayee Bose of the Department of Chemistry and Biochemistry have been awarded $1 million over the next three years to operate their joint laboratories as a national facility for research into the earth sciences using this high-sensitivity microbeam analysis technique. Secondary ion mass spectrometry (SIMS) is an analytical tool permitting measurements of elemental concentration and isotope ratios on extremely tiny areas, so that chemical and isotopic variability on scales from a few micrometers down to several nanometers can be determined. The spectrometers use beams of ionized atoms to focus on spots as small as 50 nanometers in size, which is less than one-thousandth the width of a human hair. The ions strike the surface and blast off and ionize atoms, which are then separated by mass and measured in sensitive detectors capable of counting individual ions. The process of scanning the beam over the surface creates a high-resolution chemical and/or isotopic image of the sample. Currently, ASU has one of the most extensive arrays of SIMS instrumentation and SIMS expertise in the world. The ASU researchers have been consistently on the leading edge of innovation in micro-elemental analysis. SIMS research at ASU dates back to 1984 with the acquisition of a Cameca (Paris) ims3f ion microscope by Peter Williams, capable of analysis in few-micrometer areas. A more modern and more powerful ims6f microscope was added in 1999 under the leadership of Hervig. Continuing the tradition of being at the leading edge of the instrumentation, Peter Williams (with Hervig, Lynda Williams and other ASU researchers) spearheaded the acquisition of a Cameca NanoSIMS instrument in 2011, with the capability to analyze areas as small as tens of nanometers. This combination of instruments enables applications to a broad range of scientific problems, including analyses of a wide variety of natural and synthetic inorganic materials from this planet and others, semiconductors and even biological materials. On the national stage, this facility is a key player in the mix of instrumentation that is required to conduct state-of-the-art microanalytical geochemistry and petrology. The School of Earth and Space Exploration researchers are widely known for applying their technique to analyze tiny grains in meteorites thought to pre-date our solar system, small fragments of explosive eruptions, clays and nanopores in oil-shale, and characterization of slow elemental and isotopic diffusion in a variety of earth materials, including volcanic minerals. “With the ability to analyze elemental concentrations in zoned crystals on the nanometer scale using NanoSIMS, we are now able to reconstruct the life history of a magma up to just a few hours before a volcanic eruption and determine the triggers for explosive volcanic eruptions at volcanoes, including Yellowstone,” says Till, an assistant professor in the School of Earth and Space Exploration. Hervig has developed many SIMS techniques for geochemistry and applied them to natural samples from this and other planets, as well as a variety of synthetic materials. Lynda Williams has used this technique on a range of materials at the organic/inorganic interface, specifically on the role of nanopores in understanding more about the properties of oil shales (and the environmental impact of mining them). ASU also has built a reputation for developing novel analytical applications and instrumentation and for fundamental research aimed at understanding the ion formation process. While a central focus of the school's researchers is on earth science problems, the lab is open to others, and the team commonly works with materials scientists and electrical engineers on campus and in the ASU Research Park, in addition to microbiologists and chemists. Geochemists from around the world travel to the NSF-funded National SIMS Facility on ASU’s Tempe campus to use the instruments. Since 2007, two to 12 people (undergraduate and graduate students, post-doctoral researchers, senior research scientists and faculty) have visited the ASU facility each month. They are usually from the U.S. but also include visitors from other countries.